Combine the water, sugar, cinnamon stick and vanilla bean in a heavy-bottomed 2 1/2- to 4-quart saucepan. Heat gently, stirring until the sugar dissolves, then bring to a boil and remove from the heat. 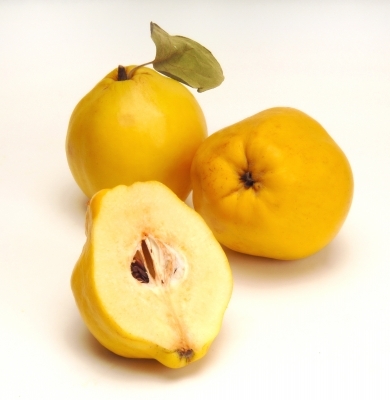 Peel the quince with a vegetable peeler and cut them into quarters. Cut out the cores and cut each quarter in half. Add the fruit to the syrup. Return the pot to medium-low heat and bring the syrup to just below a boil. Reduce the heat and keep the syrup at a bare simmer for 40 minutes to 1 hour, or until a sharp paring knife slips easily into a slice of quince. The quinces will have turned a pale pinkish color. Cool the fruit in the syrup. Refrigerated, the fruit and syrup will keep for a week or more.